Saigon is a fascinating, vibrant and youthful city, but it’s not one that’s full of must-see tourist sights. To experience the best of Saigon, focus on its minutiae; the little details of this big city. There’s no better place to do this than in the tangled network of narrow alleyways that fill in the gaps between the city’s major roads. Saigon’s thousands of alleyways – sometimes no more than a few feet wide – are where the majority of Vietnamese live, and it’s here that you’ll find the ‘real’ Saigon. What’s more, the alleyways offer far more charm and interest than the central area of District 1, where most travellers spend their time. Getting lost on foot in the web of alleyways brings you into contact with friendly local people, great street food, intriguing architecture, and, best of all, local life. And this particular ‘attraction’ is free! 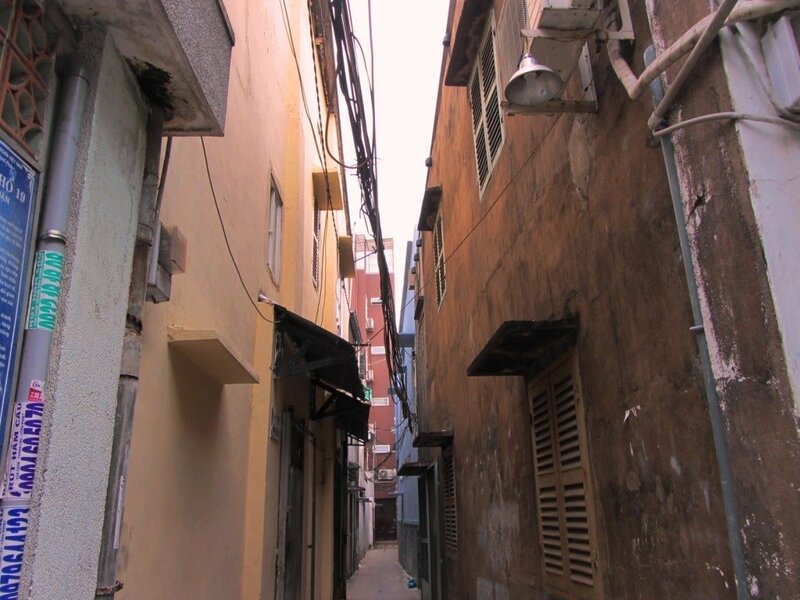 In this guide I’ve mapped and written about five of my favourite areas for alley walks in Saigon. 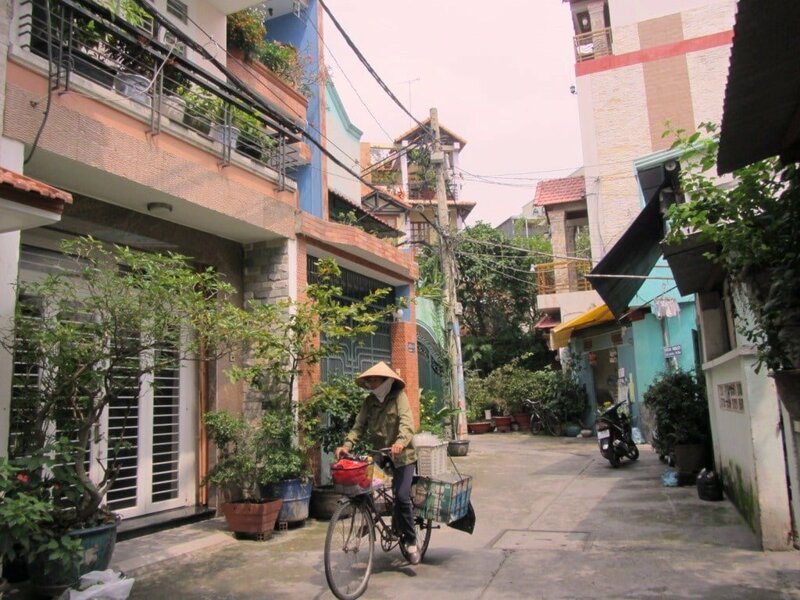 Exploring Saigon’s alleyways is a lot of fun and it gives you a chance to see real, local life….and it’s free! Alley life is a completely different (and much more pleasant) world to the one you experience on the main streets of Saigon. Walk a few metres down any alleyway and all city noises disappear, as does all traffic. The rhythm of life is slower, calmer, and on a more human scale. It’s cool and quiet, but there’s no shortage of things to see and do: colourful fruit markets, pagodas, hidden cafes, street food vendors, shrines and even tombs. Smells are a big part of the alleyways: all sorts of cooking scents the air, especially during early mornings and late afternoons, as does the perfume of washing detergent from laundry hanging out in the sun. People live in such close proximity that there’s an intimacy to alley life: you get the feeling that life is shared; children play, do homework together; families cook, eat and drink together. All this happens either in the open-air or in ground-floor rooms with the doors wide open, so that you really get to see life happening. 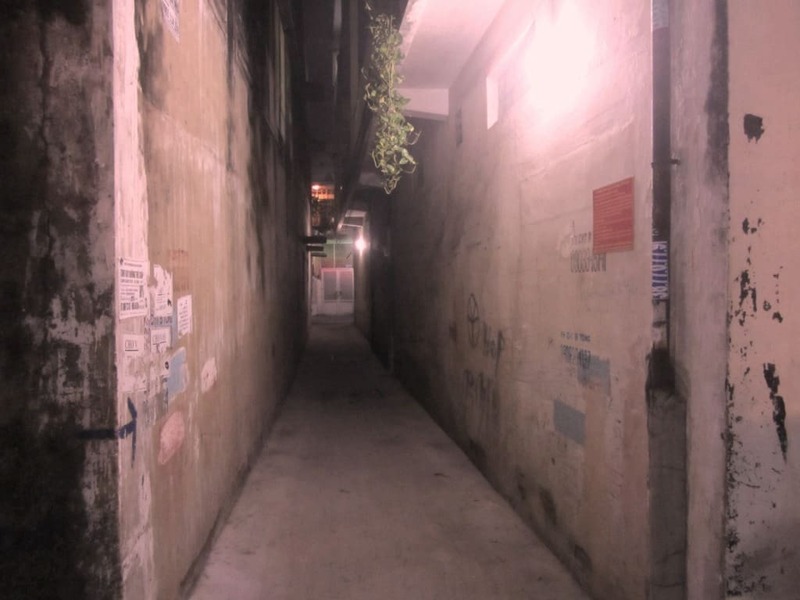 Below are five of my favourite areas for alley walks in Saigon. I’ve given a brief description of each one, including some suggestions of places to eat, drink and see. All the alley areas are plotted on my map. However, because many alleyways are too small to show up on Google Maps, I’ve simply shaded the general area. I haven’t plotted any particular route as this would defeat the point: the best way to experience Saigon’s alleyways is to wander aimlessly; eating and drinking anything that looks good, stopping to look at little bits and pieces of architecture that catch your eye; until you’re either completely lost or reach a dead end. But don’t worry, you can never really get lost because, eventually, every alleyway ends up at a busy main road, where you can hail a taxi back to your place. This collection of alleyways and small streets is hemmed in on three sides by some of Saigon’s busiest main roads, which makes the quiet refuge of shady alleys all the more appealing. Phan Dang Luu street to the north, Phan Xich Long street to the east, and Phan Dinh Phung street to the west enclose this network of affluent-looking alleyways. 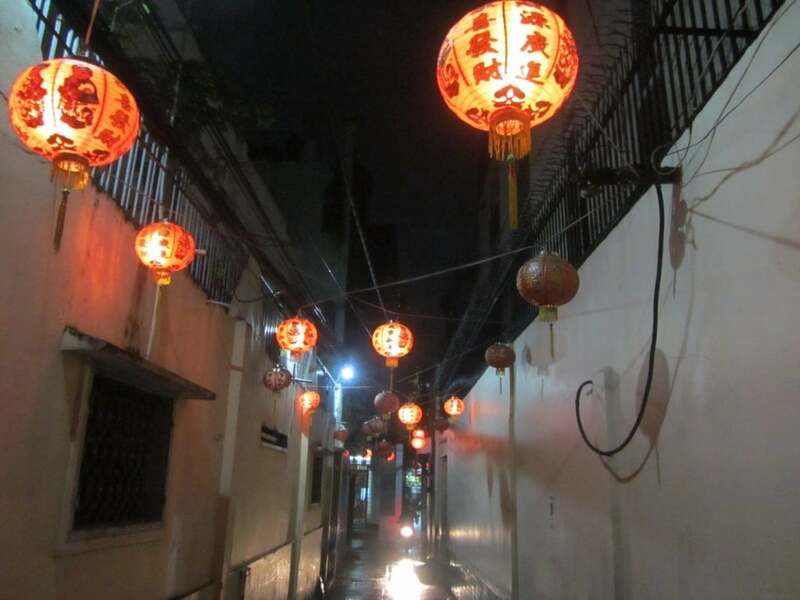 A good place to enter the alleys is on Đoàn Thị Điểm Street: there are two entrances: one from Phan Xich Long and the other from Phan Dang Luu. Weave your way past markets and food vendors until the alleys get smaller. Particularly narrow and atmospheric are the routes between Cô Bắc and Cô Giang streets. There are a lot of pagodas and temples hidden in these alleyways. You can often find your way to them by following the red lanterns lining the narrow passageways. One pagoda in particular is worth searching for: Tổ Đình Phổ Quang (127/25/13 Cô Giang) is a classic melange of old and new religious architectural styles, but it’s the walk there – strung with lanterns hanging from electrical cables – that’s most impressive. When wandering through these alleyways, don’t forget to look up so that you can see the myriad ways in which Vietnam’s middle class choose to decorate their new homes: no two houses are the same. For an iced drink or a caffeine pick-me-up after all the walking, try the Coffee House, on a corner on Đoàn Thị Điểm street. 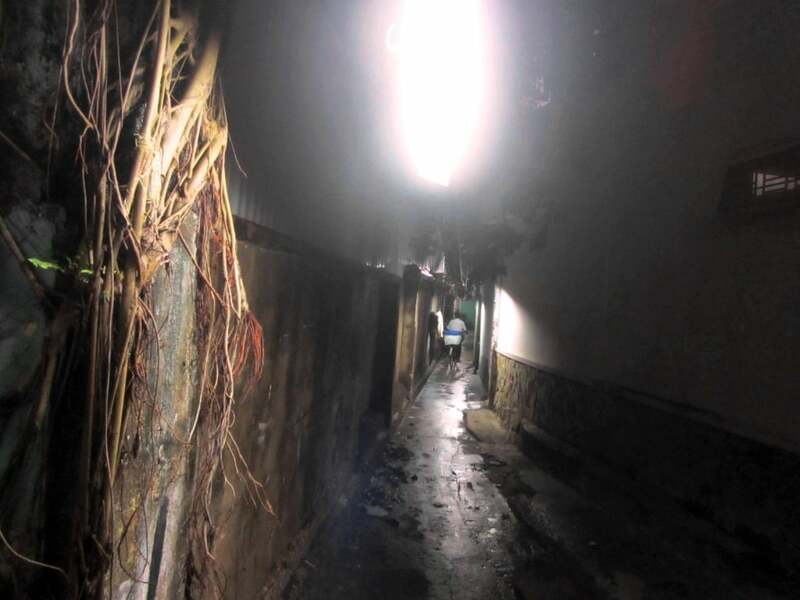 These alleyways are in the same district as the Phan Xich Long alleys, but in a very different area. Here, there’s a more suburban, village-like atmosphere: it feels as though these alleyways are a self-contained world; an autonomous quarter within the city limits. 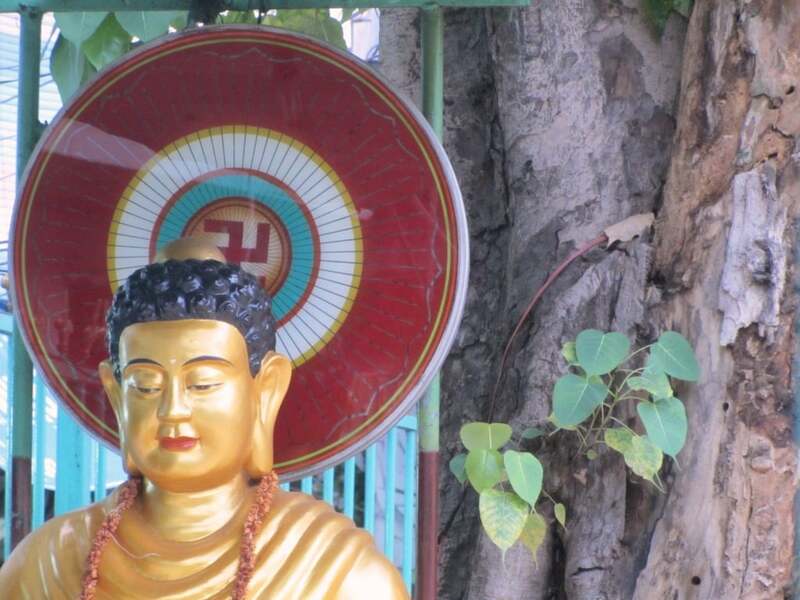 Bounded by the railway to the east, the Thi Nghe Channel to the south, and Huynh Van Banh street to the north and west, you’ll find little cafes, informal eateries, Buddhist pagodas, Catholic shrines, and small local markets. Many of the alleys have recently been repaved, leading to the construction of some large, chateau-like houses, which loom over the poorer, concrete-box dwellings of less fortunate residents. Every hour or so, you’ll hear the horn of the train blaring out as it passes behind the alleys. The narrow passageway on the east side of the tracks is home to some good shellfish and (if you’re feeling adventurous) dog meat restaurants. Alley 115, on the west side of the tracks, offers a couple of trendy cafes which are good for an iced coffee while watching the trains go by: try Cafe Nhỏ and Creative Station. Deeper inside the tangle of alleyways, don’t miss the grease feast at Quán Lệ Hồng (489/27/39), which specializes in bò né – thin-cut beefsteaks, served on a sizzling, cow-shaped plate with various accoutrements. Another good place to eat is the Chinese noodle shop on the corner of Le Van Sy and alley 137 (also known as Trần Hữu Trang street). I have a sentimental attachment to this alleyway, because my old house is located here. (Alley 137 is also a good point at which to enter the alleyways.) As you wander further west, there are several large and small temples and shrines, most of which are Catholic but some of which are Buddhist. You might also pass by Na Na Pet Coffee: a cafe where pet owners can bring their pets to ‘mingle’ with other animals. There’s lots of street food fun to be had on and around alley 541, particularly at the popular shellfish eatery, Ốc Luộc. The alleyways around Hồ Thị Kỷ street in Distirct 10 feel less affluent than the previous two areas, but they are alive with food, people and, thanks to a night flower market, colour. 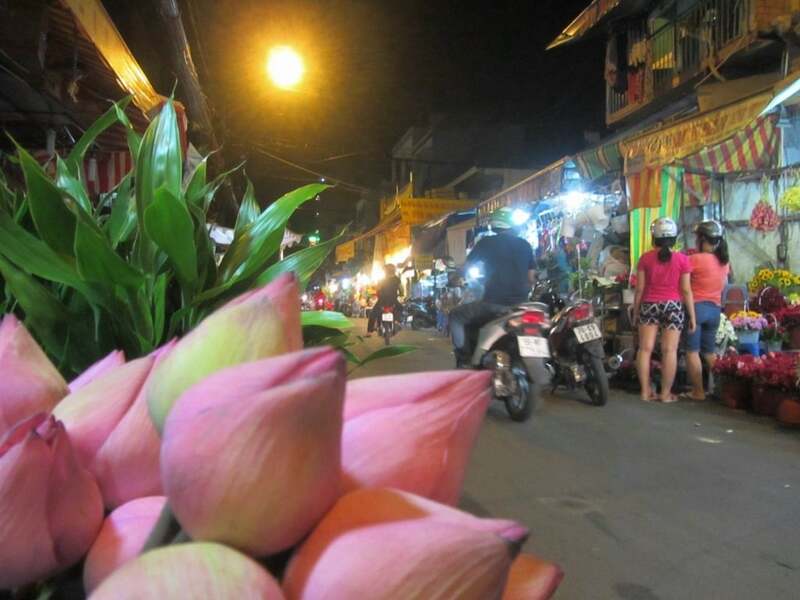 Trapped in a triangle between three main roads – Le Hong Phong to the west, Hung Vuong to the south, and Ly Thai To to the north – these alleys are best visited at night, when street food, families, fluorescent lights and flowers are everywhere. The grid of alleyways is easy to navigate: the main focus is Hồ Thị Kỷ street and two smaller lanes running parallel either side of it. One of these, Trần Bình Trọng street (east of Hồ Thị Kỷ), is where thousands of colourful flowers arrive on small trucks from the mountain town of Dalat, at around 11pm and into the small hours of dawn. This is a great time to visit, as roses and lilies scent the air and you can buy flowers cheaply straight off the trucks. The narrow lane to the west of Hồ Thị Kỷ is packed with interesting street food. There’s a large Cambodian community here so many of the food vendors offer Khmer dishes. The most famous of these is Chè Cô Huôi (57/21A), which specializes in Cambodian desserts, or chè in Vietnamese. These include fascinating combinations of fruits, jellies, candies, beans and all the other weird and wonderful ingredients that go into creating chè (read more about chè here). At the northern end of Hồ Thị Kỷ is ‘Beef Hotpot Alley’, a bustling corner where locals gather to eat, drink and talk around big pots of beef stew: try Lẩu Bò Hoàng Thu at 84/1 Hồ Thị Kỷ. To the south of the street there are plenty of shellfish eateries. Bound by some of the best street food streets in the city, this geometric network of tight alleyways are some of the liveliest and ‘tastiest’ in Saigon. A series of narrow concrete channels runs from Hoang Dieu, Vinh Khanh, Doan Van Bo streets and Xom Chieu Market. Enter the alleys from any of these busy streets with the express purpose of getting lost! The alleyways get progressively tighter as you wind your way deeper into the maze. Homes, shops and food stalls are punctuated by small Buddhist temples. Life is lived is very close quarters here: opposing living rooms are sometimes no more that two metres apart, and most houses have all their doors and windows wide open. Residents are noticeably of the older generation: men and women in their 70s and 80s sit in their open doorways at dusk, watching alley life unfold. Particularly good for food, Cầu Chông Street offers dozens of street food stalls: try the hủ tíu (rice vermiceli noodle soup) at 458 Lô Q. Or Bà Hai Bánh Xèo at 119 Lê Văn Linh street is a popular local place for bánh xèo (crispy, filled, savoury crepes). Squeezed between Tran Hung Dao boulevard and Vo Van Kiet street along the Ben Nghe Channel, this large grid of alleyways is very residential. The grid layout means that these alleys are much easier to navigate compared to the others in this list. As they are located on the border of District 5 and District 1, this network of alleyways is pretty close to downtown Saigon; within walking distance of the backpacker area around Pham Ngu Lao. Narrow channels of asphalt lead between four-storey family homes. During the day, there are plenty of local soup and rice eateries that operate out of the front rooms of some of the homes. 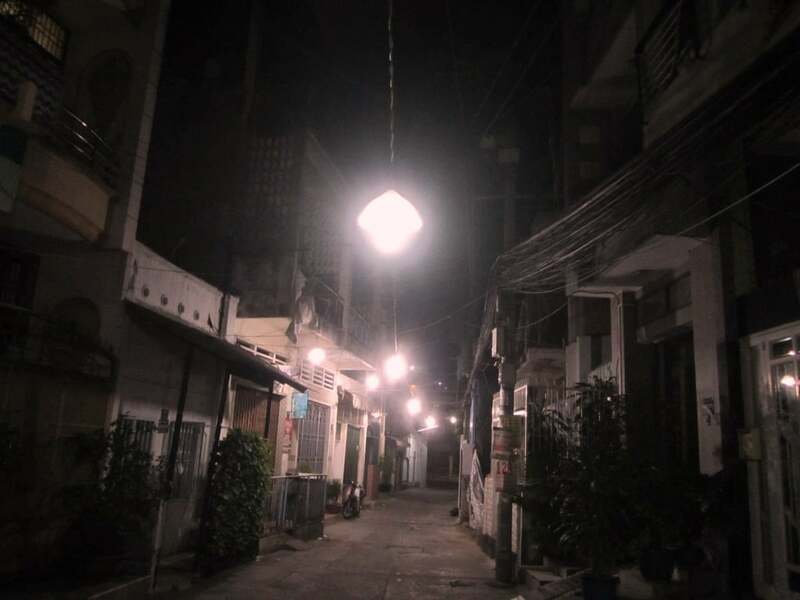 At night, the alleyways are lit by a mixture of attractive street lamps and fluorescent strip light-bulbs. Although these alleys are quieter than the others in this list, there are still several cafes, pagodas and snack bars hidden in the unlikeliest of corners. The Chai Vintage Cafe (393/6 Tran Hung Dao) is an atmospheric little place to stop for a drink. 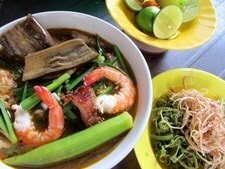 There’s lots of food on Nguyễn Cảnh Chân street and, thanks to the presence of a mosque on Tran Hung Dao street, you can dine at Phở Muslim on alleyway 457, which is definitely worth a try. 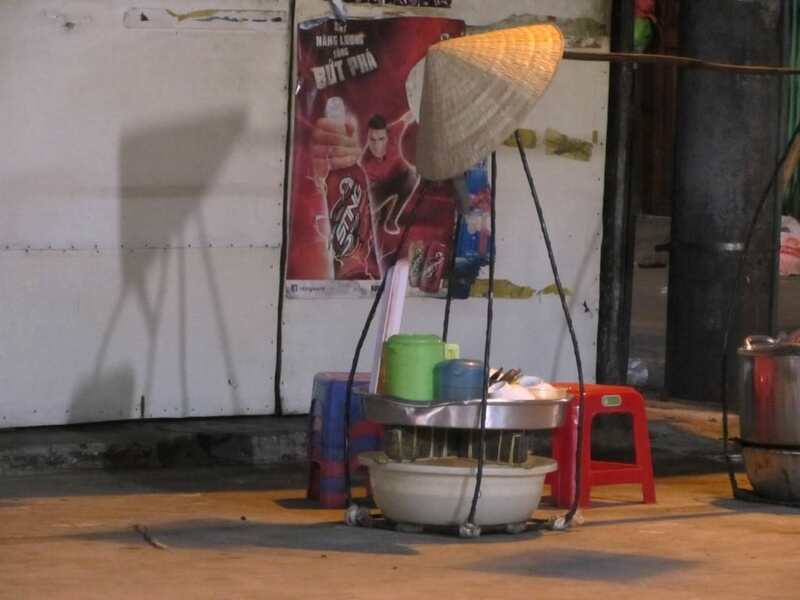 This entry was posted in ALL, DESTINATIONS, Off Beaten Path, Resources, Saigon, The South and tagged alleyways, guide, Ho Chi Minh City, Saigon, tour, travel, Vietnam, walking. Bookmark the permalink. we just came back from a month in Vietnam, following many of your advices and suggestions. 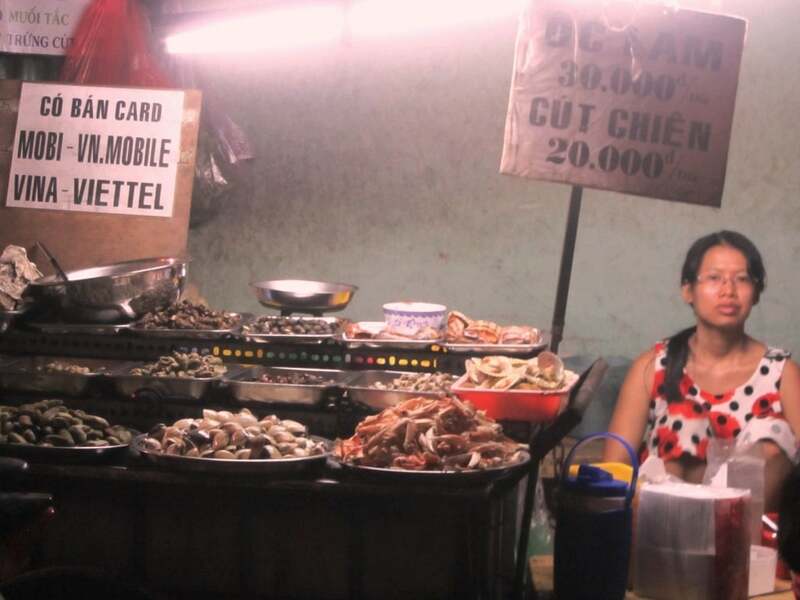 We loved Saigon because of your post about all these little alleys. This is exactly the ambiance we like when we travel. Thank you for sharing all these nice spots that we would never find by ourselves because they’re hidden and off the touristic path. Thanks. 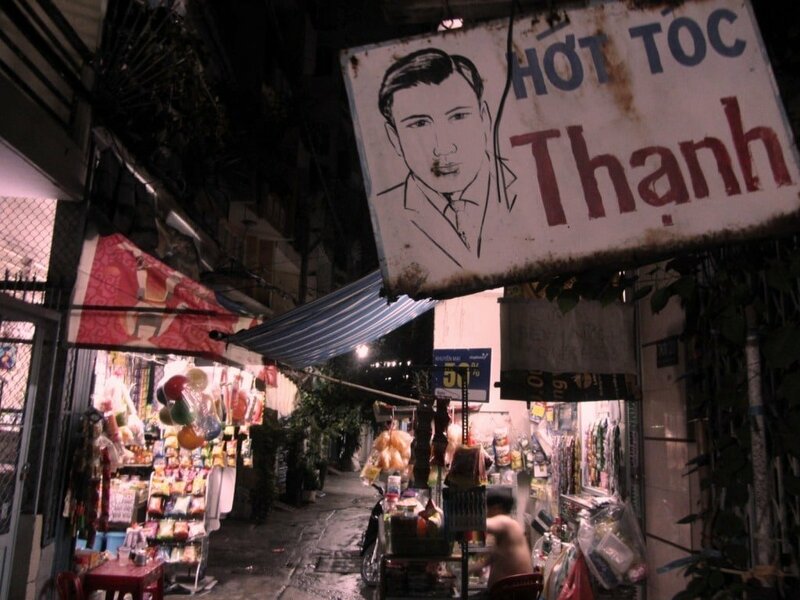 It’s fantastic to hear that you enjoyed Saigon, and especially the alleyways – I never get bored of wandering down them. Great to hear that you’re enjoying the alleyways – I love wandering through them too. I hope you continue to find more interesting cafes down the narrows alleys. I wondered the streets myself the other day and a little bored. Read your post this morning after my walking tour got cancelled and had the best day! Walked the first two myself, had told one of my roommates about it and he joined me at the chai vintage cafe which was fantastic. Such a great hidden gem. Then rode through the other three. Great work, very nice post, I sometimes can walk like this in Hanoi. 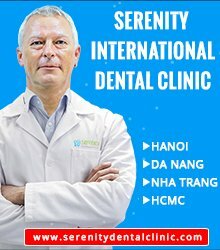 Wish to show you this in Hanoi too. Thank you so much for sharing this and definitely do this when I am in Saigon at the end of this month. Yes, I would like to do some more alley walking in Hanoi, but whenever I’m in the city I never seem to get the time. I hope you get the chance to explore the alleyways next time you’re in Saigon. 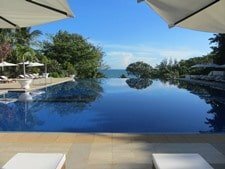 I’ve discovered your site recently while planning a trip in Vietnam and really liked your articles. Unfortunately, I don’t have so much time to do a motorcycle trip… I usually come to Saigon for work and stay in a hotel on Le Van Sy str. for around one month. My working schedule is very tight to go out of Saigon but there is plenty of time to explore the city. So I am also very sentimental about the alleys in that area. They are everywhere here and waiting to be discovered! During one of my walks I met a 50-year old guy who had lived in my country(Bulgaria) in his youth. He got so nostalgic that day… and we’re still friends now! I hope you continue to enjoy your trips to Saigon. 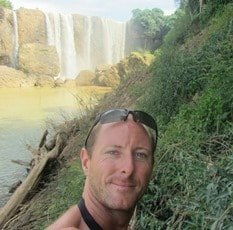 Pingback: Why I love Saigon - LivingNomads.com - Discovering our world! Hey Tom…. In Saigon at the moment on our fourth visit and fall in love with the country more every time. Thanks for doing such an awesome guide… Ended up being invited to lunch with a local family after wandering through the alleyways. Six hours of eating and drinking later…. You couldn’t buy an experience like that if you tried. 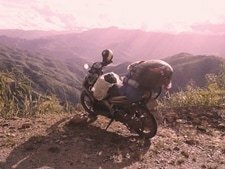 Looking forward to coming back in Nov to explore Ha Giang area on bikes. Thanks again for all the info on here. You’re living the life I should be living! Good to hear you enjoyed getting lost in the alleys. 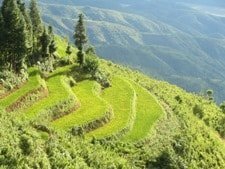 Ha Giang might be a little cold in November, but it’s a stunning area in any weather. Thanks for the rely back. If you only visited a few weeks ago then maybe check it out when you have time to ensure its status. Some locals told me it was no longer in business (could be a lost in translation case though). Afterwards I looked at their FB page and the last post was in 2013. According to Google’s Vietnamese translation, it appeared their last post was saying goodbye as they close down the business. However, if you were a few weeks ago then I probably read that wrong. Anyways, thanks for all your hard work and the alley walk was spectacular! Thanks! Great to hear that you’ve been exploring the alleyways! Thanks for the updates – I’m not sure how I missed the fact that An Mộc has closed – I was there only a few weeks ago. Oh well, turnover for small businesses like that in Saigon is incredibly fast. I hope you continue to enjoy Saigon and its ‘secrets’. And.. you meet a lot of nice people there. They are kind of surprised and maybe a kind of proud that someone is interested in how they live their everyday lives. I love the alleys around Hem 491 (Le Van Sy) and it doesnt matter which direction you take. Also great alleys to visit are in District 7 around Trần Xuân Soạn street or between bridges Cau Rach Ong and Cau Nguyen Van Cu. Riverbanks between bridges Cau Rach Ong and Cau Him Lam are then more slum like. I eat a rat sandwich there (have been told its beef). It was so tasty, that I bought another one! Glad you enjoyed the alleyways. Yes, I also particularly like the alleys on Le Van Sy – I used to live there. I’ll try the ones you suggest someday soon.